10 Seconds to CHANGE A HABIT Business Growth Hack: ABSORB YOUR CLIENTSâ&#x20AC;&#x2122; STRESS! 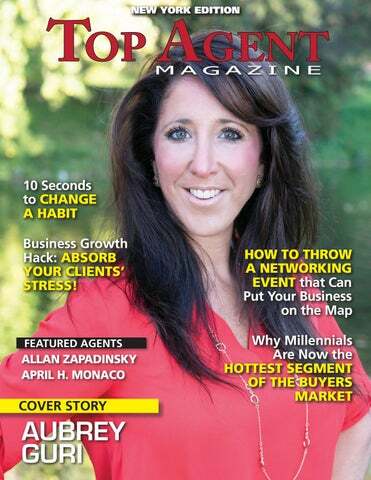 To learn more about Aubrey Guri visit geraldine.com, e-mail Aubreyadg@gmail.com, or call (518) 857-1942 www. 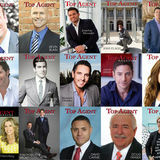 on being featured for the state of New York in Top Agent Magazine! Joanne Russell, President (NMLS 60138) The Mortgage Place, Inc. (NMLS 872824) 646 Plank Rd, Suite 102, Clifton Park, NY 12065 518.982.0480 Office | 518.573.2012 Cell themortgageplaceinc.com www. Allan is actively involved in his community and supports several charities including the American Red Cross, recently providing support for victims of Hurricane Irma. He is also involved with the Cornell Alumni organization. When he isn’t working, Allan enjoys fantasy football, reading, and is still an avid tennis player. To Learn more about Allan Zapadensky call 646 -879 -0727, email azap@kwnyc.com or visit facebook.com/AllanZapadinsky and truthoverproperty.com www. of our tips and tricks below and you’ll be more than ready to throw a networking event that’ll put you on the map. Throwing a networking event can position you as a local business leader, and you’ll be able to curate the experience to your tastes and goals. to your area. It should also have easy-to-access parking so that attendance is streamlined and hassle-free. Also consider sending an automated event reminder the day before and the day of the event—that way you’ll set guests up for easy attendance that they don’t have to debate. CREATE A THEME. Capitalizing on a holiday or local event is a great way to drive attendance to your networking function. While getting to know area professionals is a worthy reason to meet up, you’re likely to engender a livelier ambiance if you incorporate a holiday or theme. This will inspire comradery among your guests, in addition to giving your event a natural focus. Major sporting events, a Thanksgiving themed pie bakeoff, or a spring cleaning themed community volunteer day can generate more interest than your average mixer. sense of community so that opportunities flow naturally and conversation remains diverse. BE THE BOSS. As host, it’ll be your job to play matchmaker and drive conversation at your networking event. This means that you’ll get to know more people, but it also means you’ll be able to create connections between different professionals and businesses. You can maximize your matchmaking abilities by planting a few socially-minded friends around to drive additional conversations. Your goal is to keep people talking and to be outgoing. It should also be your goal to follow-up once the event is complete. Use this as an opportunity to continue to connect different people you met, or to follow-up with coffee or lunch with someone you found interesting. Try sending out a group thank-you e-mail to your guests after the fact, telling them to keep an eye out for your next event, or to get in touch with you for any questions or contact information of fellow attendees. While it may feel like a risk to throw a networking event, it’s a risk worth taking. By positioning yourself as the host of your event, you’ll drive awareness to your business and brand, and build up the local professional community in a way that’s sure to draw good will your way. Keep these ideas in mind as you go about planning a memorable networking event of your own, and above all—have a good time and others will follow suit. When confronted with a “tough” decision (e.g.) Prospect for business or check out Facebook? - Eat this serious piece of cake or go for the fruit? - Go to the gym or turn on the TV? - Return the phone call or put it off for tomorrow? Take a deep breath and picture yourself doing what’s right, not what’s easy. Surrender the self-imposed stress you associate with the change. Let go of the history of excuses and make a better choice NOW. Follow through with that thought (NOW), not just to make this better decision, but also to set a pattern of realizing the power you have in controlling your life. This is a simple, but valuable lesson about helping to develop confidence and a positive self-esteem. Most who go to the many varieties of therapy, usually go because of lack of control issues or self imposed victimization. Show yourself what you CAN DO. Learn and use self-hypnosis and hypnosis to reinforce the habits you choose. In “speaking” to your subconscious mind with words, pictures and emotion, in a relaxed state of mind, you are encoding brain cells with instructions (cause). You become what you think about (effect). Hypnosis will speed up learning, whether it be specific subject matter or whether it be learning an improved habit, 2-5 times faster. Habit change doesn’t have to be difficult, but it does usually entail being Mindful. Exercise your good decision making abilities and you’ll develop a do it now attitude, improve physical health and energy, develop consistency in your business, more fully enjoy your relationships and so much more. Copyright©, 2016 Barry Eisen. All rights reserved.